Here's how to get into the holiday spirit without killing yourself—or your utility bill. Before you even touch a string of lights, you'll need to develop a comprehensive plan of action. First, decide on the scope of this project and make sure you stick to it—running a line of icicle lights around a door frame is much easier than illuminating every square inch of your house. Decide where you'd like to install lights—along roof lines and walkways, around windows and planter boxes, or draped over shrubs and trees—and measure the lengths that will actually be adorned as well as the distance to the nearest outdoor power outlet. You may need to break out a ladder when performing the initial measurements. If your house has horizontal eaves, you can get a rough estimate of the roof line simply by measuring around the base of the house. If the house has peaked eaves and gutters, you'll need to use a ladder and tape measure to obtain accurate lengths. Be sure to also include door and window frames in your totals. For plants, according to Lowe's, you'll want to use at least 100 lights for every 1.5 feet of vertical height (a six-foot tall shrub would need a minimum of 400 lights, for example). 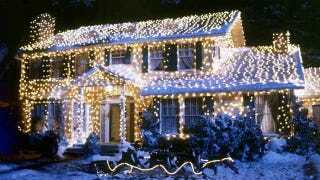 Once you have the distances totaled, use that value to calculate the number of 50-bulb light strings needed to cover it and how long the extension cord will need to be. Skip the 100-footers. Shorter strings are easier to handle when standing on a ladder, and they're cheaper to replace if something goes wrong. Incandescent Minis: These lights have been around since your parents were kids. They remain a popular choice for holiday lighting because they're relatively inexpensive, and they draw just 1.5-2.5 volts. You can find them in a multitude of colors, bulb styles, and lengths, from 50 to 300 lights per string. If you elect to use these bulbs, make sure they are UL (Underwriter Labs) approved and rated for outdoor use. C-7: These 2.5-inch tall, 5-watt bulbs are larger and more robust than conventional mini-lights, and they're capable of operating even when one or more individual bulbs have failed. However, they also burn hotter and consume double the energy as minis. C-9: Also known as "retro bulbs," these three-inch tall, 10-watt lights pull the most power of all available bulb types and burn incredibly hot. However, their large size and brightness allow them to easily be seen from the street. LED: The most recent innovation in holiday lighting, LED bulbs may be more expensive to purchase than conventional incandesents. But they also emit brighter light, don't heat up from use, and draw just 10 percent as much energy. What's more, LED's are very difficult to break, and will operate for thousands of hours more than other bulbs. When choosing lights, you'll want to take a few minutes to think about the electrical requirements. To calculate a light string's energy use, multiply the wattage of the individual bulb by the number of bulbs on the string, and divide that total by 115, to get the total amps. This figure must be at least 10 percent less than the string's maximum amp ratings to prevent it from tripping the circuit breaker or blowing a fuse. To avoid overloads, as a general rule, don't string more than 300 lights (or three 100-bulb strands) together at a time. Basic hand tools including a screwdriver, mallet, and pliers. When setting up the ladder itself, especially if you're using a extension ladder, make sure to position it on solid, level ground and set the upper end firmly against the side of the building. If two story climbs just aren't your thing, "consider keeping your lighting at ground level or areas that you can reach comfortably on a step ladder," Anne Dijamco of The Christmas Light Pros advises. Also, you are not a ninja. Hang those lights during daylight hours, when it isn't raining or snowing. Employ an assistant, if for nothing else than to attach mounting hardware to strings, hold the ladder as you ascend it, and fetch you a beer when you're back on the ground. Hanging holiday lights is thirsty work.